Celebz Gossips: Tom Cruise… Celebrity Evangelist? Scientology keeps on making it into the news. Popular CNN host Larry King has always been up front about his battle against depression and taking antidepressants. Enter Scientology Tom Cruise. TOM CRUISE made an attempt to turn Larry on to Scientology, a religion that openly discredits and disavows modern Psychiatry. 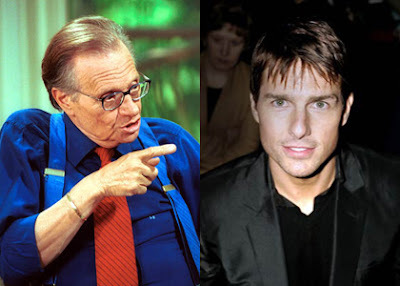 MSNBC reports that the Mission Impossible star personally took King on a tour of the Scientology exhibit, “Psychiatry: An Industry of Death” to try to convince him of the dangers of modern Psychiatry and the virtues of the religion .